On the morning of May 29th, I woke up from a good night’s sleep with a sense of urgency to immediately write down some ideas that came to mind just as I was waking up. I intuited these ideas were in response to my ongoing open-ended questions about the nature of reality. Groggily, I got out of bed, walked over to and sat down at my desk, and began filling four index cards with ideas. 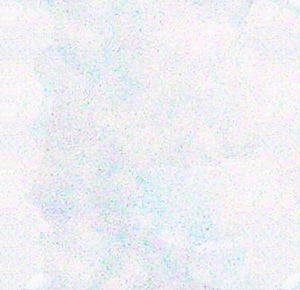 "Most of what we call consciousness operates in a subconscious manner," I wrote on one side of an index card, flipping it over to add further details about how conscious will moves us through classical physical reality, and subconscious choices move us through quantum reality in which “I” am not a single operator, but rather a multitude of unified subsystems working together as “I am” awareness. "Consciousness is primary and non-material,” began the second card, with additional information on the back. I filled out four index cards front and back with insights, and found myself immediately longing to find scientific researchers who are thinking along these lines. Metaphysical ideas are great, but I feel happiest when able to share such ideas right alongside scientific evidence that supports their premises. Though I wracked my brain, no scientists came to mind who are writing about levels of consciousness that communicates up, down, and across with one another, and a cursory internet search turned up nothing. I filed my note cards safely away for another day, confident that at some point I’d chance upon scientific research providing some kind of theory and evidence along these lines. Bell explained that there are no levels in biological systems that autonomously compute, but rather there exist mesoscopic junctions. The main operational principle in our brains and all living matter is what Bell calls Level Switching Networks, where emergence and submergence are constantly happening all the time. In addition to the joy I felt from experiencing the delightful synchronicity of my one day wishing to find a theoretical neuroscientist who could provide scientific validation to the notion of levels of communication operating in consciousness and the next day hearing exactly such a theory. I was thrilled with the significance of what such levels of emergence and submergence imply. The idea that we are constantly connecting with levels of consciousness helps answer the deceptively simple, yet fiendishly challenging question, Who am I? There are many selves within each of us, as at times we may think of ourselves as being our physical body, at other times our role in our community, or at other times as being awareness. The fact that I so often find exactly what I seek within a day of longing for it, no matter how seemingly unlikely such wishes may be demonstrates to me how these levels of communication are constantly operating not just inside of me, but also between me and everything else. The fact that such seemingly miraculous shifts in reality typically occur after I’ve been meditating validates for me that meditation is an excellent way to literally "shift gears" between physical realities, enabling me to “shift up” to a higher level of awareness of self. By entering a meditative blissful, grounded, energized daydream state while feeling genuine desire for whatever I know I need, I connect with whatever or whoever that might be. Such is the feeling of living a waking dream, of living lucidly with the realization that my very sense of "I am” consciousness is awake in the form of identifying with conscious moving between various possible realities and levels of self. I will be giving a talk and signing copies of my books and CDs in Santa Cruz, California next month, and I would love to see you if you can make it to my upcoming event! And if time or distance prove to be a challenge, I hope you can enjoy one of my recent interviews! Cynthia talks with Researchers Radio hosts Joe Kiernan and Dr. John Ilias about quantum jumps, describing scientific research in the fields of medicine, physics, biology, psychology and sociology that come together to provide fresh new insights and practical information about how we most likely live in a multiverse, and what it means to have many possible You's and many possible Me's. Thanks to quantum effects occurring at the macroscopic level in what scientists increasingly agree appears to be a holographic multiverse, we experience quantum behaviors such as entanglement, coherence, teleportation, and superposition of states in our everyday lives. A growing body of scientific evidence suggests that quantum phenomena are not only occurring on the tiny microscopic quantum scale. Natural systems show clear signs of preferring quantum methods for such processes as: photosynthesis, avian navigation, and olfaction (our sense of smell). The implication of this growing body of interdisciplinary research suggests that consciousness is pervasive and primary in influencing events, and that we select between parallel worlds in a holographic multiverse. I've got some really exciting news! Psychic Medium Andy Myers has interviewed me, asking questions about time shifts and quantum jumps, and features me in his first "Believe Radio Network" show as their very first guest! Andy and I first met at a time travel conference, so it makes perfect sense that our conversation would naturally move in that general direction. Did you get a chance to hear this interview when it aired? If not, I think you’ll really love this one, because Irene Conlan shares some of her reality shift and quantum jump experiences that happened shortly after she began thinking about this topic. Irene talks about how when she needed a spoon to eat dessert, all she had in the drawer were soup spoons, yet a short while later when she made some soup, all she had were teaspoons! Yes, reality shifts really can be every bit as surprising and unpredictable as that, to help keep us on our toes! 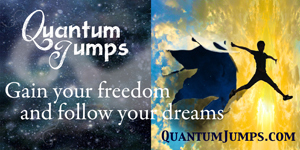 Come Quantum Jump with me & Dr. Irene Conlan on The Self Improvement Show! In Mission 161 Jeff Belanger and crew explore reality shifts and Quantum Jumps with Cynthia Sue Larson. Have you ever been running late and wished you could slow down time? Have you ever thought a black cloud was hanging over your head and everything was going wrong? Maybe it is all your fault? What if changing your outlook and intent could change the entire universe around you? Larson joins us to tell us it's possible. She has a degree in physics, an MBA, and is a Doctor of Divinity, and tonight we explore her book: Quantum Jumps: An Extraordinary Science of Happiness. Dr. Dreck stops by to teach us sometimes there's no place like your own reality. Dänna Dennis Wilberg interviews Cynthia Sue Larson about quantum jumps, quantum physics, and how you can benefit from fundamental properties of quantum physics for greater happiness. Cynthia talks about what we mean by a superposition of states, and describes the experiment involving Schrodinger’s cat. Cynthia explains how some exciting scientific studies and findings inspired her to write “Quantum Jumps,” outlining the idea we live in a holographic multiverse where there are ways to connect between parallel universes. Recent evidence of quantum behavior happening on the macroscopic scale has been discovered in green sulphur bacteria. Cynthia explains what it means to have entered the new Quantum Age, with quantum computing, quantum algorithms, and new quantum ways of thought. Discover useful aspects of some of the seemingly strange behaviors and properties from the quantum realm, such as the significance of the Placebo Effect, what it means to have many possible Me’s and You’s, and find out some amazing ways that quantum jumps can make a difference for you in this half-hour interview. Dänna Dennis Wilberg interviews Cynthia Sue Larson, talking about reality shifts, quantum jumps, quantum physics, and how our thoughts and feelings change the physical world. You are consciousness, and can experience different realities by identifying yourself with being consciousness, rather than merely a physical being. We all experience the benefits of healing when we experience the wonderful sensation of suddenly getting over a cold, or feeling better when someone kissed an injury and we felt better. Cynthia talks about real-life healing experiences people have had in which they moved from injured or sick realities healthy ones, and describes three essential steps for making successful quantum jumps. Anita Moorjani discovered she did not have to fear anything, and accessed an awareness of being able to choose between a wide number of possible realities. Find out why lucid dreamers and Near-Death Experiencers tend to experience some of the most remarkable reality shifts and quantum jumps, and what you can do to jump into your best possible life. I had been looking for a coffee grinder in a charity shop off and on for weeks. Whilst in Scotland over Easter, we were driving to St Andrew's from Edinburgh, and stopping in coastal towns along the way. When we reached one town, we decided to walk along the high street, with me popping in to look at shops. We were crossing a street when I suddenly said to my husband, "Oh, I am looking for a coffee grinder. Let me just pop in that charity shop!" It was on a side street, and my husband was getting bored, though he went with me grudgingly. AND—there it was, on display in the shop window! And it was a good brand, and nearly new! We were both left wordless! (It only cost £3.00=$5.00, when the normal cost is about $50.00!) Out of the blue, I emailed a friend I met four years ago in a course. I hadn’t heard from her in months. I knew she'd had money problems and I suddenly thought about her. I got an email from her the following week. She explained that she had a new email address as her old one had been disconnected some months back and with that she lost all her email addresses, and she was emailing me from her new address, but only because she had found the post it note I had originally given her with my email address four years ago whilst in the course! She, of course never received my email, but she got in touch with me only because she found a note with my details on it by chance and thought to get in touch with me! It makes me feel good when these things happen, and I’ve become more mindful. In recent months, there have been other examples which is what has caught my attention and made me more mindful, and also has made me feel sustained. I've come across books that clearly I am meant to read as I go through changes and open up to learning and receiving and allowing, without fear. Note from Cynthia: I love these first-hand reports that so beautifully demonstrate the interconnectedness between you and who and what you most love and appreciate--coffee grinder & reconnecting with an old friend! Experiences like these serve to remind us all that we are not ever truly alone, nor are we ever disconnected. Instead we are part of a vast network that includes everyone and everything we've ever loved and cared about before, everyone and everything we love now, and everyone and everything we will ever love. Thanks so much for sharing this! Since i got conscious of the fact that reality shifts do exist , i shift more times. Ive noticed when DONT want something to be around me , and i start hating it , it just get worse. When you stay happy and LOVE YOURSELF and your own peace, and don’t give attention to negative things (what’s the point anyways?) All the bad things disappear. There was this annoying bird whistling to loud and when I calmed down and realized that it doesn’t bother me that much anyway, and started enjoying myself, it went away. This happened three times that morning! I also notice lately when something annoying finally gets out of my way I’ve got this very strong feeling almost deja vu like that the annoying thing was never there in the first place! Note from Cynthia: Thanks for making such a good point about the importance about not getting into a hateful emotional space, because things really do seem to get worse that way, and of course making time to meditate and get into a really happy, loving emotional state brings about immediate good reality shifts, for sure! I had a reality shift with Mcdonald’s. It had been three years since I’d eaten there when I recently ordered the "quarter pounder" and found it was totally different than in the past. It was twice as small, and in a way not as juicy as it used to be. I asked my mom, and she said she noticed the same thing, and advised me to return it. So, I went to the order counter, spoke to the manager, and he told me that “It’s always been the same,” for like 10 years since he worked there. So I went home, googled to see if some people in Holland have noticed the same issue, but couldn’t find anyone having noticed a difference. Now I’ve been through a lot of drama in three years, but in a way it made me a better, different person since I’ve learned what I truly want in life. Perhaps that drama shifted me to a different reality. Note from Cynthia: You're right about the truly bizarre factor in food offerings being different, because food is one of those things most of us humans take seriously, and really pay close attention to. Seeing a drier, smaller version of hamburger sounds quite remarkable! It seems that you surely can't be the only person noticing this particular change; it's possible you'll see other posts about it in the future. And I can't help wondering if when you get into a happy enough state of mind you may find yourself back in a reality with the juicier, bigger Quarter Pounders again! I am in a serious rut in my life as a college student I regret not making better study choices in the past which cause my grades to be lower than what I truly want them to be. How can change my past? Helpful tips or anything that can help me? I am seriously freaking out here. While it is possible to change the past, I suggest playing the metaphorical ball in life where it lies; meaning, making the best of current situations. One thing you can do besides daily meditation and focusing on what went well today that you had something to do with (and what that something was), is to recognize that you're now choosing "Easy World, where everything is easy." Life doesn't need to feel stressful or hard, and things can get better and better. Make a commitment to yourself to learn from what's happened so far, and promise yourself you're now committed to always doing your very best, at the same time as you open your mind to the possibility that after making such commitments, you're all set to see whatever degree of miraculous changes to the past might happen to occur. Stay open-minded, and keep asking, "How good can it get?" and really mean it that you want to find out! 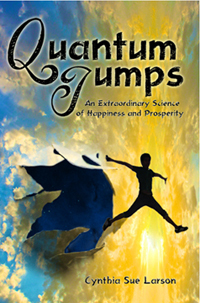 Is Quantum Jumps the best book to get started on Quantum Jumping? Is this book suitable for a beginner? Quantum Jumps is perfect for beginners! There’s a theory in quantum mechanics that, when a particle travels from point A to point B, it’s actually taking all possible paths, and the apparently straight-line trajectory from A to B is the net result. (more technically, it’s each path weighted by its probability, with most possible paths crossed out by their opposite number.) I’ve wondered if the trajectory of our own lives is like that. Is where we are in life the net result of all the + and – possibilities, most of which cancel each other out? What if quantum jumping is a way to increase the probability of the positive outcomes and reduce the probability of the negative ones? Instead of the positives being mostly canceled out by the negatives, the positives prevail and take us onto a new and better trajectory. It seems quite possible that quantum jumping assists us in making better, more intelligent, more conscious choices amongst a multitude of possible realities. We can contemplate the set of all of our choices as representing all the universes of possibility that exist, and envision our sense of "I am" as being consciousness, free to explore via conscious choice through this multitude of possibilities. In a sense, none of the physical realities are thus the "real reality," but rather the complete set of all possible realities taken together as one holographic multiverse comprises all that is. Hi wanted to ask if you could create a video for facebook that shows how to ground ourselves, protect our aura and connect to source each day and set the intention that these things stay in place all day. This video above contains the four steps I consider most essential that everyone should do each day to ensure best energetic health through grounding, sealing the aura, clearing the cords, and receiving angelic assistance. At this juncture in history in which physicists seek to unify the physics of the very large with physics of the very small, and theories for reality involving consciousness abound, I'm refreshed and invigorated to read a thoughtful treatise that lays the cognitive framework by which we can place such questions and possibilities in best perspective. Rescher addresses the subject of intelligent design from a logical, philosophical perspective, inviting readers to thoughtfully consider some of the biggest metaphysical questions. Dr. Rescher's book, "Axiogenesis," addresses the philosophy behind what is sometimes popularly referred to as the "fine-tuned universe" which brings attention to the fact that our planet and universe is astonishingly well-suited for life. Odds against our world coming into existence completely at random appear to be statistically improbable, leading some current scientists to suggest our universe may exist in a multiverse. Axiogenesis presents a complete philosophical framework for intelligent consideration of why anything exists at all, citing Plato and Leibnitz as early proponents of optimalism. Rescher answers G.W. Leibniz's question, "Why is there anything at all?" seeks an ultimate explanation from the realm of possibilities, in which various theoretical possibilities are ruled out until at last only one privileged alternative remains. And in this quest to answer the ultimate hard question, Rescher begins Axiogenesis by explaining that what we are truly seeking is nothing less than an explanation for the emergence of a domain of existents from an existentially empty realm of a nonempty world. A quest for ultimate answers demands holism, and the basic tenet of optimalism is such that the prevailing world order is the best that can be actualized, and the best possible order exists because that's for the best. There is admittedly a kind of self-validation at work here, yet that is precisely what makes sense in a world where Nature is clearly the great optimizer, dealing in superlatives so that maximum effects are achieved with minimum energy. Rescher's style of writing is concise, clear, and entertaining, including such lively quotes as King Alfonzo X's remark when studying the Plolemaic system of astronomy, "If the Lord Almighty had consulted me before embarking on his creation, I would have recommended something simpler." I especially enjoyed reading quotes from many of the philosophers and scientists Rescher references in Axiogenesis, including: Plato, Leibniz, and Gödel. In an optimal world, Axiogenesis would be required reading for all scientists, in order that the real "hard problem" of why there is anything at all gets the proper attention it deserves, with an answer that finds increasing relevance as we enter the Quantum Age. IN OUR OWN HANDS is a remarkable resource for people seeking the best way to live with chronic illness. Berkelhammer shares effective techniques that he's found to substantially improve his quality of life, sharing a wealth of current scientific research and findings that are well beyond the scope of what most medical doctors provide for their patients. Organized in four parts, the first half of IN YOUR OWN HANDS starts out describing mastery and wellbeing, explaining how and why a practice of mindfulness is especially valuable for improving one's health. The second half of the book explores the importance of how well the choices we make are aligned with our values, providing a great deal of tips and suggestions for ways we can better practice helpful qualities such as: gratitude, loving self-care, self-acceptance, self-expression, meaning and purpose, service to others, relationships, and humor. I'm tremendously impressed with the way IN YOUR OWN HANDS is structured, and with the way it starts by indicating the kinds of unhealthy mental attitudes many people inadvertently and unwittingly participate in as a matter of habit. 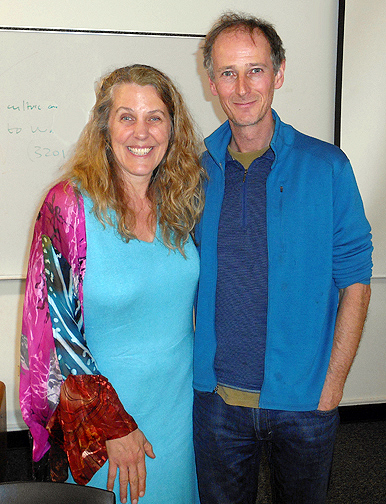 For example, when discussing the hazards associated with cognitive fusion, in which we associate something (such as a noise, sight, or smell) with another environmental stimulus (such as medicine or a treatment of some kind), Berkelhammer shares a fascinating real-life account of laboratory mice who died of pneumonia after having been exposed to camphor. Their immune systems were compromised as if the camphor was being combined with psychophosphamite, a chemical that compromises the immune system. The takeaway lesson is made quite dramatically in this example that when we practice mindfulness, we can reduce the number of ways we inadvertently stress ourselves thanks to learned associations between a number of factors. I especially love the way Berkelhammer describes the three major components of mindfulness as: observing the experience, describing the experience, and participating in the present experience. Berkelhammer provides ways readers can practice mindfulness in daily life through something as simple as becoming conscious of making choices as often as possible, and increasing the number of conscious choices you make that are harmonious with your personal values. IN YOUR OWN HANDS is packed with research, practical tips and suggestions, and wonderful ways of becoming and staying mindful in daily life that will help all readers--not just those currently suffering from chronic health challenges. Highly recommended!